techs. D300 1/125 F4 ISO 800 witha 500 AF-S II. Perhaps reduce some of the magenta hues overall? Love the water droplets & the cold nature of overall frame. I feel you nailed this one, Dave. I like everything about it, including the cool tones and closed eyes. The streaking rain drops are a wonderful element, and tell the story so well. A top-notch image! Fantastic! Love the closed eyes and the raindrop streaks! a beauty of a shot and I like that you took it as a vertical image, excellently done DAVID. the eyes are slightly open, the rain well do that. Ha! I remember your other one from this encounter. I loved that one, and I love this one. I agree that the closed eyes give even more emphasis to the lion's discomfort in the driving rain and the whole image really speaks volumes and tells the story perfectly without words. Brilliant capture, Dave! Love the colors on that one ! There is a nice ambiance around it! Great capture Dave ! This tells the story so well, Dave! The closed eyes, the pathetic angle of his head, and the rain coming down. Couldn't be better. 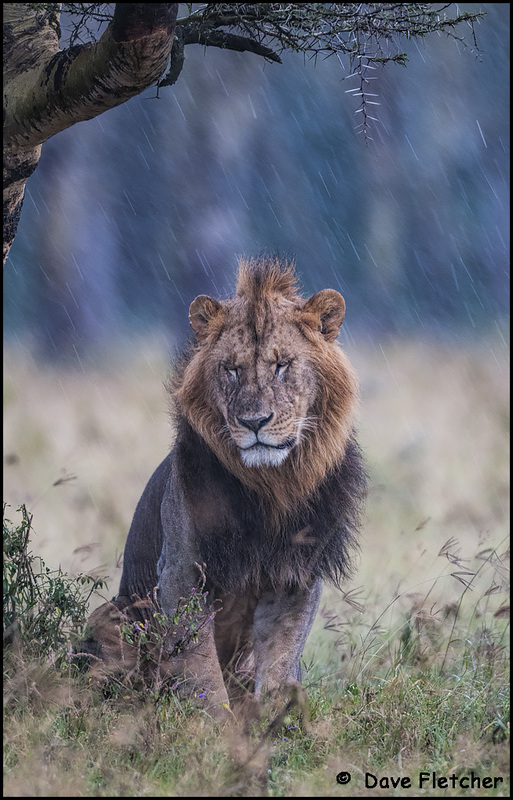 I don't think I've ever seen a picture of a lion in the rain either. Quite unique. Top notch! Dave, congratulations on the well deserved EP.